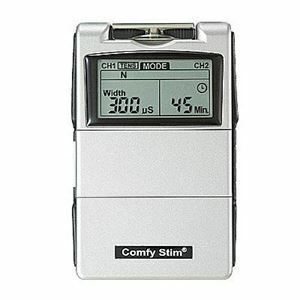 The Comfy Stim combo is a compact, portable dual channel stimulator combining a TENS for pain relief and an Electrical Muscle Stimulator(EMS) for muscle reeducation. The TENS mode is used in symptomatic relief of chronic intractable pain, post traumatic and post-surgical pain. The EMS mode is indicated to maintain or increase range of motion, prevent deep venous thrombosis, improve local blood circulation, etc. In the Comfy Stim Combo Set, the Comfy Stim device is offered with everything the patient needs for several months of use: rechargeable batteries(2), charger and 4 sets of adhesive electrodes(16). Not CSA approuved.